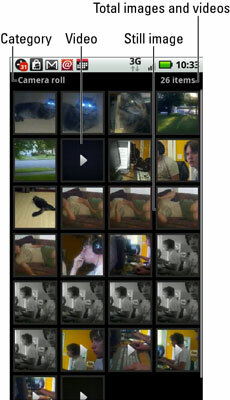 To access images and videos stored on your Droid X, you start the Gallery app. You can find it on the Applications Tray. When the Droid Gallery opens, you see images organized into categories. Touch a category to open it and view the pictures or videos it contains. Share an image: Send the image elsewhere using the Internet or a text message. Delete an image: Touch the Delete button to remove the image you’re viewing. You’re prompted before the image is removed; touch the OK button to delete the image. Use an image for a contact or as wallpaper: Touch the More button and choose the Set As command to apply the image you’re viewing to a contact or to set that image as the Home screen wallpaper (background). Crop: Choose Edit→Advanced→Crop to slice out portions of an image, such as removing an unwanted relative or a former paramour from a family portrait. After you crop the image, choose the Apply command to keep the portion of the image that dwells within the orange rectangle. Press the Back soft button to return to the Gallery. Rotate left, rotate right: Choose Edit→Rotate. Use the circle control on the touchscreen to reorient the image. Touch the Save button when you’re pleased with the results. You can find additional editing commands by pressing the Menu soft button, then choosing Edit→Advanced. Because images contain visual information, searching and organizing images tend to be haphazard tasks. One method to help you keep your pictures and videos organized is to tag them. 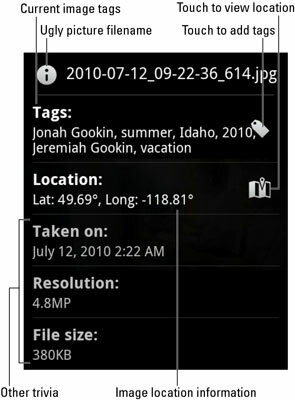 Touch an image to view it by itself on the Droid X touchscreen. A lot of information about the image appears. Use the onscreen keyboard to type a tag. Single-word tags work best. If you need to be more descriptive, add more tags. You can use tags later to search for images. So think of a tag that you would use to find the image if you were doing a search. While you type, you may see contact names appear. If so, choose a contact name to tag the contact in the image. Touch the green plus-sign button to add another tag. Touch the Done button when you’re finished tagging the image. The tags you add appear on the image information screen. They’re also used when you perform a search by using the Droid X’s powerful Search command.